PRODUCT DESCRIPTION: Plastic framed red housing which has a metal pad on the floor where targeted rodents will walk. When turned on, the pad carries a negative charge on one side and a positive charge on the other side. The two sections of the pad are not touching allowing for the charge to remain for long periods of time. Rodents which enter the chamber will act as a bridge between the two pads and effectively ground it out leading to their death. When the two pads ground out, they will deliver a 30-60 second bolt of electricity which is strong enough to kill many small rodents. It works off high voltage and very low amps. In other words, it can't kill a person if someone was to accidentally ground it out. They would feel discomfort; a pain where they touched it for sure, but it can't do any damage. 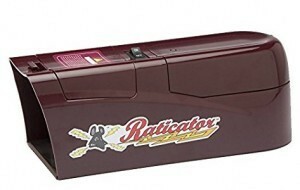 The unit features an off/on switch located on top, runs on 4 AA batteries and will deliver up to 25-50 kills (larger animals will use up the batteries faster). Install lithium batteries for longer lasting power; up to 100 kills per set of batteries. TARGET ANIMALS: Mice, Rats, Chipmunks, Squirrels, Voles, Shrews and other small animals. Bait with pet food, bird seed and for added lure, some of our PECAN PASTE. Just be sure to set the Pecan Paste in something that will contain it like a plastic soda bottle cap or a water bottle cap. This way the paste won't "run" if the device is deployed in a hot area. HOW IT WORKS: As mice and rats enter the chamber, they'll quickly be dispatched by a quick and powerful jolt of electricity. Approximately 50 kills per set of 4 alkaline AA batteries makes these units easy to use and reusable; up to 100 kills with lithium batteries. WHERE TO USE IT: Attics, crawl spaces, garages, drop ceilings and any place where you have rodent activity. Can also be used outside but when doing so, make sure it's well protected from water. The TRAP TUBE is designed to help protect it and strongly suggested if you plan on using one in a wet crawl space or outside. Be sure to keep it away from where small dogs have access. The rule is any dog under 10 lbs will be vulnerable to it; old dogs could get hurt by it as well. Children and people in general are not at risk though the shock would be painful. However, be sure to keep it away from where anyone can find it accidentally or if they can, be sure to have it marked clearly that it is designed to deliver an electric shock. RATE OF APPLICATION: At least one per area of activity. Like most devices for rodents, the more you have the better and if you have several areas of activity you can avoid having to move the device around to complete your control program by having two or three. PRODUCT SIZE: Each unit is approximately 4" wide by 4" tall by 10" long and weighs around 1 lb.